SKATEBOARD ART! Ever since I was a kid I have had a real interest in both skateboarding and the graphics used to decorate the decks. I remember we used to choose our boards based on the graphics as much as we would on the kick, concave and cut designs. The images represented our personalities as we hit the concrete. 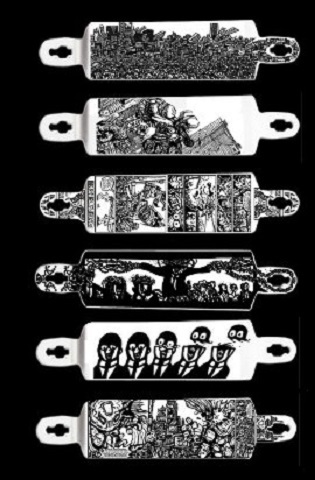 Some of my all time favorites were the old Powell Peralta Bones Brigade Skeletons and the striking Walker Skateboards Nightmare graphic. Needless to say in that I am always excited to create images for skateboard companies. 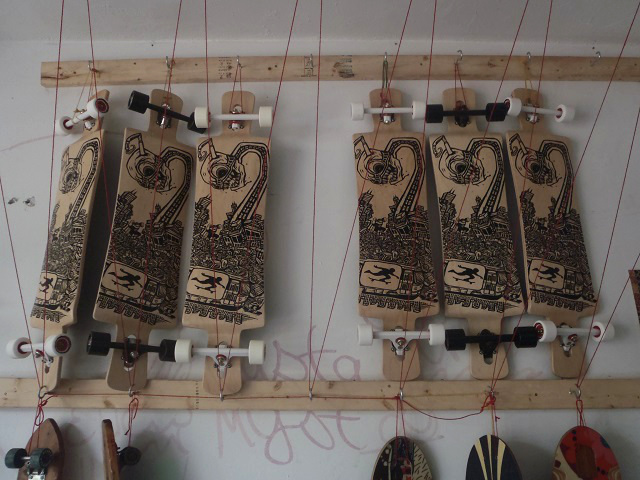 Over the past few years I have built a strong relationship with a Toronto Company called Longboard Living. 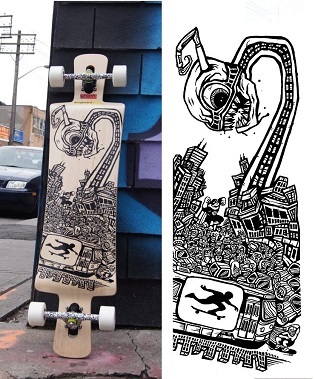 We started doing one of a kind original boards and selling them in the streets around 2007 or so. Since then the company has successfully grown expanding from the streets to small shop and eventually two major locations. Since the beginning I have produced several limited edition designs as well as a few murals for their stores. 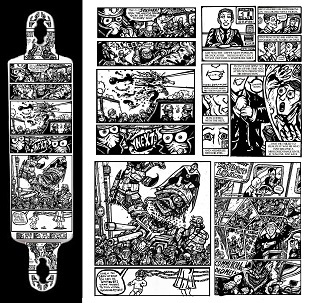 “The Return of Superhero” is one of the first skateboard designs that was commissioned by Ryan Rubin for his company Longboard Living. This drawing features a surreal rendering of the city of Toronto. Beneath the watchful eye of the all SEEING TOWER the metropolis is under attack by rampaging monstrous mechanizations. In the middle of the madness a tiny hero arises wearing an eye-balled cape, but can this super-heroic denizen save the city or is it too late? The image was originally painted with acrylics directly on a custom skateboard deck and has since been produced in a very limited screen printed edition. Some of the other boards I have done also feature variations of the city theme. 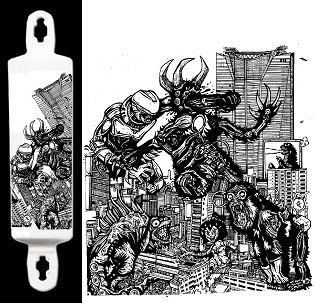 One of the most popular designs depicted the CN Tower as a giant monster screaming at the city. This image also had the superhero as well as a longboard skater peeling through the streets. My 2013 model took an entirely different approach and depicts a psychedelic tree with deep roots representing Mother Nature. 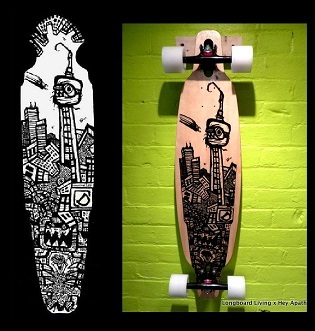 This board was a part of an Earth, Wind and Fire series in which Longboard Living commissioned different Toronto artists took tackle the elements. More recent designs have been professionally printed in larger editions, usually around 200 boards each.